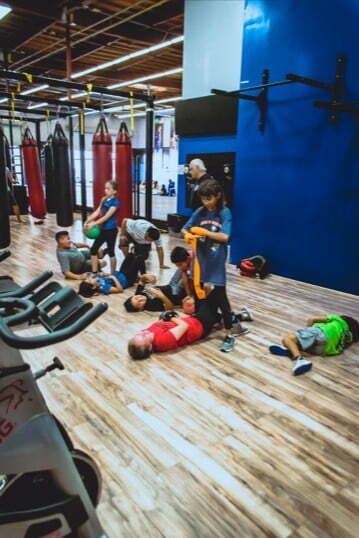 The Fit Kids program is functional fitness created especially for our students. Kids fitness workouts include calisthenics such as speed & agility drills, jump squats, burpees, push-ups, and core strengthening. This class is guaranteed to improve your child’s overall strength, core, balance, and speed. Besides enjoying the above health benefits, kids who are getting regular exercise tend to sleep well and are able to better handle physical and emotional challenges — from running to catch a bus to studying for a test. Don’t wait! Check the schedule above for a kids fitness class time that works for your family. The percentage of overweight and obese kids has more than doubled in the past 3 decades. There can be many different factors contributing to this epidemic, but for the most part, children are becoming more sedentary. In other words, they’re sitting around a lot more than they used to! According to the Kaiser Foundation, 8- to 18-year-olds watch approximately 4.5 hours of TV a day. And the average kid spends 7 hours each day on all screen media combined (TV, videos, computer, and video games). One of the best things you can do for your kids is to be active with them and to limit the amount of time spent in sedentary activities, especially watching TV or playing video games. Come check out our quality, yet affordable, kids fitness classes in Escondido | San Marcos area. Call now for a TRIAL CLASS with NO ENROLLMENT FEE! Whether you're a novice or a seasoned veteran this gym is a warm and welcoming place where you are family. I am so happy to have found a positive and inspiring school where I constantly learn and improve my jiu jitsu game as well as my life. From the opinion of a person new to BJJ, this school has everything needed in order to train. There is a flexible schedule with morning, afternoon, and evening classes. Don’t Have Time To Call? Fill Out The Form Below! Ask About a Trial Class with No Enrollment Fee! Sign up today for a FREE lesson at SDBJJ!